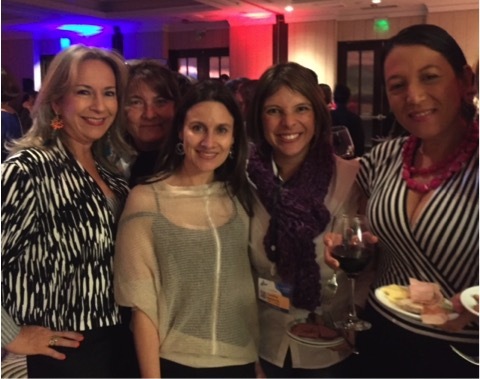 IAHPC grants to 20 Traveling Scholars helped them attend the IX Congreso Latinoamericano de Cuidados Paliativos in Saniago, Chile, held in April. This is the report of Ms. Martha Lucia Franco Garrido, representing the Association of Palliative Care of Colombia, followed by comments from a few of the other grant winners. Next month, more of the Traveling Scholars will report on their experiences at the congress. 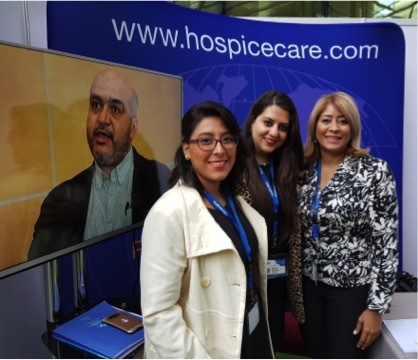 Thanks to its participation in the IX Latin American Congress of Palliative Care (ALCP), the national Association of Palliative Care of Colombia (ASOCUPAC) managed to both make itself better known, and strengthen its links, with institutions in Latin America and Europe. 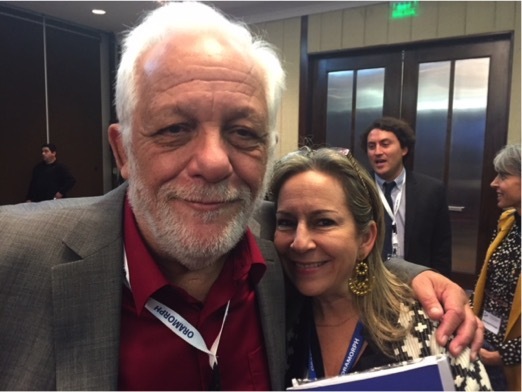 Martha Franco with Dr. Roberto Wenk at the ALCP in Chile. One of our greatest achievements during the congress was the conclusion of an agreement with Ecancer.org to support us in our second international palliative care conference, II Congreso Internacional de Cuidado Paliativo, being held 4-5 April 2019 in Cali, Colombia. In return, we agreed to provide our academic support for its platform. Ecancer is an international non-profit organization with a virtual medical platform for free education of palliative care for Latin America. In order to support each other, Dr. Jorge Duruame, responsible for the organization of Ecancer’s Virtual Modules and its content in Latin America, has asked us to participate as guests of the 1st Ecancer Symposium on Palliative Care in Buenos Aires, Argentina, in September. We also identifed and spoke with some international speakers that we want to have in our 2019 congress in Cali. During the ALCP, there was a scheduled meeting of the Psychosocial Commission where many projects in Latin America were consolidated that allowed for direct participation from individual representatives in the psychosocial field. We shared our experience of organizing the upcoming 1st Symposium of Psychosocial Support in Oncology and Palliative Care, planned in conjuction with The Colombian League against Cancer and the College of Colombian Psychologists. The aim was to gather all psycho-oncologists, psychologists, and social workers of Colombia. An informal evening allowed participants to mingle. I met with Rafa Mota of SECPAL (Sociaded Española de Cuidados Paliativos), and we agreed to begin working jointly on common aims. I also took the opportunity to hold a meeting with the Observatorio Colombiano de Cuidados Paliativos (OCCP). Although ASOCUPAC is part of the OCCP, more effort and planning is required to adequately advance our common needs. In order to better achieve our goals, it was proposed that we create a common work agenda, and further support efforts by the ASOCUPAC and OCCP teams to make our joint efforts endure over time. Also, the University of El Bosque asked for our endorsement of the First International Congress of Palliative Nursing, to be held 2-3 August 2018 in Bogotá, Colombia. ASOCUPAC strives to create strategic alliances to provide education to professionals of our country as one of the fundamental engines to offer quality palliative care to patients and families. The association works jointly with institutions, competent national and international authorities, and especially health professionals. 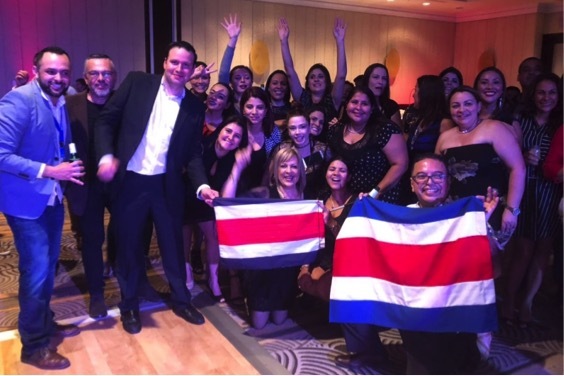 Team Costa Rica shows its colors. Currently in my workplace, the palliative care service at San Juan de Dios Hospital, we want to create a specialized consultation of palliative medicine for non-oncological diseases, mainly cardiology, HIV, renal failure, and liver failure. With the new knowledge and skills acquired during the Congress, I will be able to develop this project in a better way and thus offer a better quality of life and death for patients in non-oncological terminal condition. Dr. Bethania Martinez Del Villar visiting a booth. I plan to pass along the information I have gained by arranging a conference for those working in these specialties: geriatrics, rehabilitation, and care of the oncological hematopathic patient. The main needs in the Dominican Republic are including palliative care in health policies, access to opioids, palliative care training, and home care. I learned that knowing where resources are, and learning how others improved palliative care in their countries, makes good results easier to achieve. I am the only palliative care physician at my center, and I had a lot of doubts about the care of my patients and if I am doing the things right. The Congress helped to clear all my doubts by asking questions of the professionals and learning from a wide range of topics. I will do my best at my center to put in practice what I learned. Where I live, we lack palliative care doctors and opioids; the Congress showed me that there are many people fighting for access to opioids, and for the right of palliative care physicians to prescribe them. It was my first activity in the Latin American setting. It allowed to me link names to faces and forge closer bonds for the future. In my practice, I will be able to apply new knowledge and tools, such as scales and questionnaires. I learned that we all have our own difficulties to solve, that quality certification is important, and that health policies should be managed at a national level. 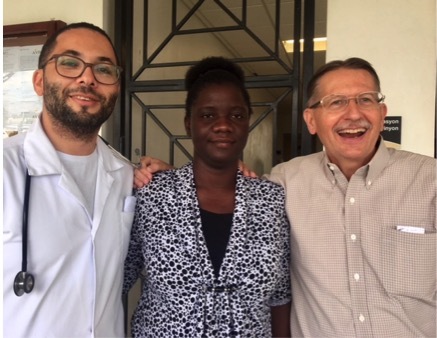 Mike Gosey (far right) with Dr. Ornella Sainterent (middle) and medical resident Dr. Carl Frederic Dauhetelier. I just returned from the second of my two IAHPC Traveling Fellowships to Haiti. It was amazing! I visited the Partners in Health University Hospital in Mirebalais, where I had the privilege to teach during its second annual four-day palliative care seminar. The attendees represented six different specialties: pediatrics, internal medicine, emergency medicine, anesthesia nurses, surgery, and OB/GYN. During my first visit, in December, I was invited to participate in a palliative care seminar attended by Family Medicine residents and other health professionals at one of two hospitals supported by Partners in Health. My second visit was timed to coincide with the same seminar for those working at the other hospital. The enthusiasm of participants was palpable. Everyone I spoke with expressed the desire to learn more and strongly supported having this ‘much-needed’ service available to their community. It was exciting to witness and be a part of. I was fortunate to spend some valuable time in the oncology section learning more about the health care system in Haiti; I even had the opportunity to consult on several patients. My juices were flowing! The current palliative care team is new, with a focus on patients with cancer, but growing. The team plans to send an oncology nurse to a training center in Uganda to become palliative care certified, which would be a very valuable addition to the team. I am excited and honored to report that I was invited to join the team in an ongoing capacity via Skype and to return to teach at their annual seminar presented at the two different sites. What a trip! Prior relationships were strengthened and new ones were made. I had increased participation in patient management, gained further knowledge of a different health care system, and received an invitation for an ongoing collaboration. Thank you, IAHPC. To find out more about IAHPC’s Program Support Grants, and our Traveling Scholarships and Traveling Fellowships, please visit our website. Through these programs we support projects and individuals around the world, especially in developing countries in Africa, Eastern Europe, Asia, and Latin America. You can contribute to this program and help palliative care workers attend and participate in congresses and courses by donating to the Traveling Scholarships Campaign in the Global Giving website.